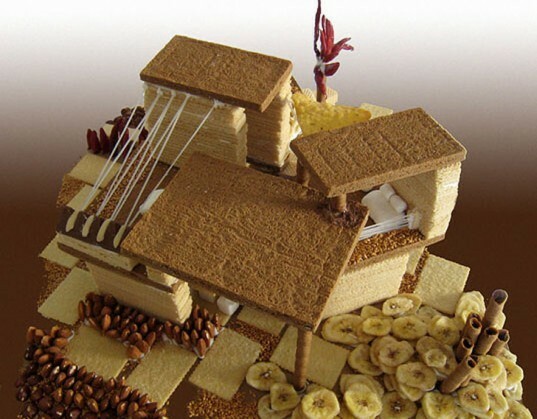 Everyone loves a classic gingerbread house, but lately architects and designers around the world have cooked up some amazing modern iterations that make our hearts skip a beat. Just in time for the holidays we've rounded up 10 of our favorite contemporary gingerbread homes, all of which pay homage to the modernist spirit. 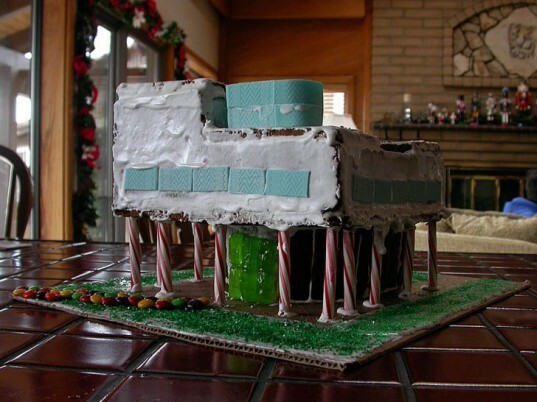 From an abode inspired by Bucky Fuller's geodesic dome, to a "cake study" house featuring cookie countertops, to a delectable recreation of Corbu's famed Villa Savoye complete with candy cane pilotis, hit the jump for the sweetest, most scrumptious modern gingerbread houses around! 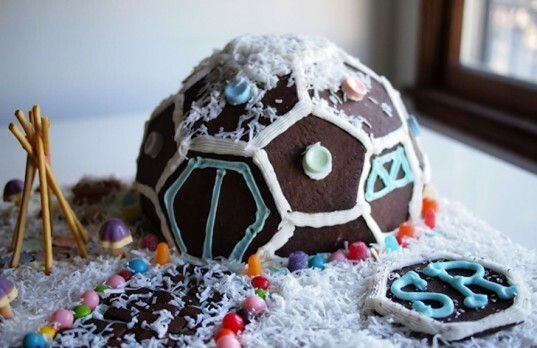 There is no doubt that this amazing gingerbread geodesic dome would make Buckminster Fuller proud. The super tasty abode was created by the designers over at Scout Regalia, and can even be made on your own at home. For instructions check out the video here, or for a little more help, you can order a DIY package from their site. It includes a template for the dome as well as recipes for both the gingerbread and icing. We had flashbacks of our first year of architecture school when we spotted Bryan Boyer‘s amazing gingerbread Villa Savoye. With Dremel cut candy cane pilotis, bubble gum windows and sugary green lawn, if we got to make one of these in studio, we’d probably still remember Le Corbusier’s “Five Points”. Designed for an icy landscape – or chocolate icing landscape – Canada’s Mallen Architecture Inc. created the Arctic Retreat, an elevated prefabricated stricture able to withstand heavy gumdrops and over-sweetened sleet. Despite its spindly, sugary support legs, the structure is surprisingly strong and even boasts a little LED light inside for an overnight stay. A GINGERBREAD NYC LOW LINE? 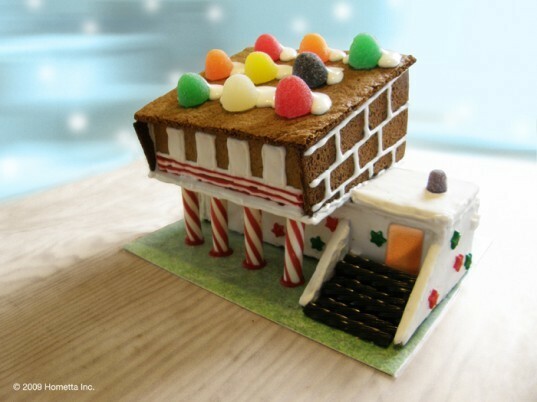 This forward-thinking gingerbread design was created for the 2008 Creative Room Gingerbread Competition & Charity Auction. With its billowing form and curious overhead cover, this entry kind of reminds us of RAAD‘s proposal for a NYC Low Line. Do you see the resemblance? With its clean lines and modernist appeal the Cake Study House 09 would have fit right in with the works of Koening, Eames and Neutra. Made by architect and LEED AP Kristina Hahn Atelier, this sugary stunner features almond cacti, a pepper Palm tree, Toblerone stairs, hard gingerbread floors, cookie countertops and marshmallow furniture. Called the Earthship Lollipop, this delightful home by Khai Foo & Elise Young of Solus Decor and Eastside Design has a rammed-icing English Mint wall with high cocoa-mass qualities to mitigate sweet-loss. The design was submitted to a competition to raise funds for Architecture for Humanity. Hometta‘s Prefab Gingerbread House is by far one of the coolies icing-glazed houses on the block. An immaculate design with a sloping roof and a modular formation, we can imagine this baby evolving from an edible construction to an ultra-efficient prefabricated design. Busby Perkins & Will‘s green-roofed gingerbread home melds perfectly with the landscape and juts out at one end like a natural extension of its sweet sloping site. A cool rectilinear design, green roof, and minimal color palette makes this house especially delectable. HOK, one of our favorite eco-minded firms, decked the halls of this gingerbread home with so many sustainable systems it even achieved LEED Platinum! 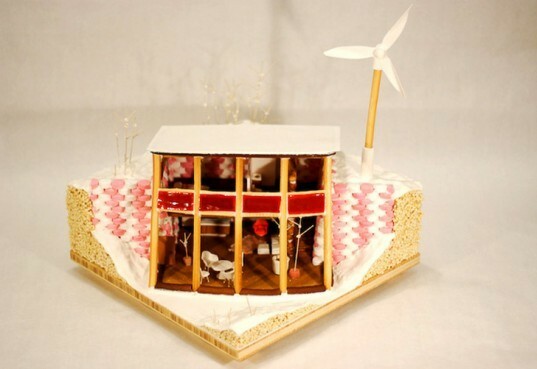 Featuring Hershey’s Chocolate solar panels, gumdrop wind turbines and black licorice rainwater collectors, we’re pretty sure they’ve set a precedent with this scrumptious home. Nick Milkovich Architects‘ Sugar Shack is definitely a stunner that draws upon the style of various modern greats. 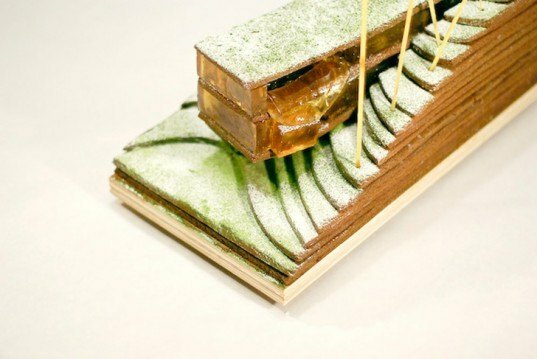 A simple sugar abode sits atop an inclined site of gingerbread and icing, affording amazing views from within its near transparent and tasty space. Hopefully those surrounding sugar trees will keep things cool inside when the sun shines bright. We had flashbacks of our first year of architecture school when we spotted Bryan Boyer amazing gingerbread Villa Savoye. With Dremel cut candy cane pilotis, bubble gum windows and sugary green lawn, if we got to make one of these in studio, we'd probably still remember Le Corbusier's "Five Points". 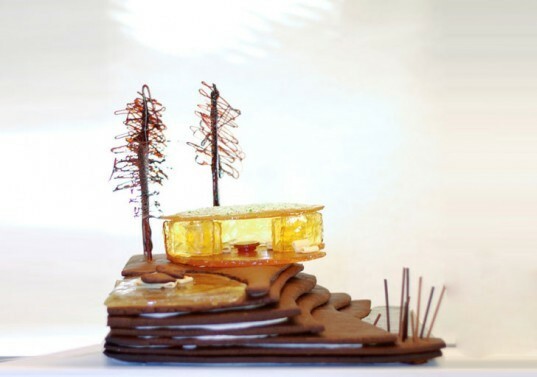 SWEET ARCTIC RETREAT Designed for an icy landscape - or chocolate icing landscape - Canada's Mallen Architecture Inc. created the Arctic Retreat, an elevated prefabricated stricture able to withstand heavy gumdrops and over-sweetened sleet. Despite its spindly, sugary support legs, the structure is surprisingly strong and even boasts a little LED light inside for an overnight stay. Designed for an icy landscape - or chocolate icing landscape - Canada's Mallen Architecture Inc. created the Arctic Retreat, an elevated prefabricated stricture able to withstand heavy gumdrops and over-sweetened sleet. Despite its spindly, sugary support legs, the structure is surprisingly strong and even boasts a little LED light inside for an overnight stay. GINGERBREAD GEODESIC DOME HOUSE There is no doubt that this amazing gingerbread geodesic dome would make Buckminster Fuller proud. The super tasty abode was created by the designers over at Scout Regalia, and can even be made on your own at home. For instructions check out the video here, or for a little more help, you can order a DIY package from their site. It includes a template for the dome as well as recipes for both the gingerbread and icing. 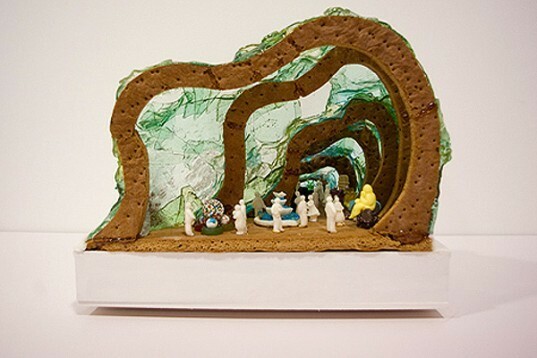 A GINGERBREAD NYC LOW LINE? 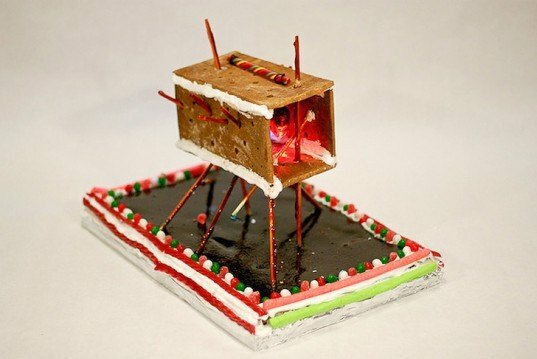 This forward-thinking gingerbread design was created for the 2008 Creative Room Gingerbread Competition & Charity Auction. With its billowing form and curious overhead cover, this entry kind of reminds us of RAAD's proposal for a NYC Low Line. Do you see the resemblance? This forward-thinking gingerbread design was created for the 2008 Creative Room Gingerbread Competition & Charity Auction. With its billowing form and curious overhead cover, this entry kind of reminds us of RAAD's proposal for a NYC Low Line. Do you see the resemblance? Hometta's Prefab Gingerbread House is by far one of the coolies icing-glazed houses on the block. An immaculate design with a sloping roof, and a modular formation, we can imagine this baby evolving from an edible construction to an ultra-efficient prefabricated design. BUSBY PERKINS & WILL GREEN-ROOFED GINGERBREAD HOUSE Busby Perkins & Will's green-roofed gingerbread home melds perfectly with the landscape and juts out at one end like a natural extension of its sweet sloping site. A cool rectilinear design, green roof, and minimal color palette, makes this house especially delectable. Busby Perkins & Will's green-roofed gingerbread home melds perfectly with the landscape and juts out at one end like a natural extension of its sweet sloping site. A cool rectilinear design, green roof, and minimal color palette, makes this house especially delectable. LEED PLATINUM GINGERBREAD HOUSE HOK, one of our favorite eco-minded firms, decked the halls of this gingerbread home with so many sustainable systems it even achieved LEED Platinum! Featuring Hershey’s Chocolate solar panels, gumdrop wind turbines and black licorice rainwater collectors, we're pretty sure they've set a precedent with this scrumptious home. 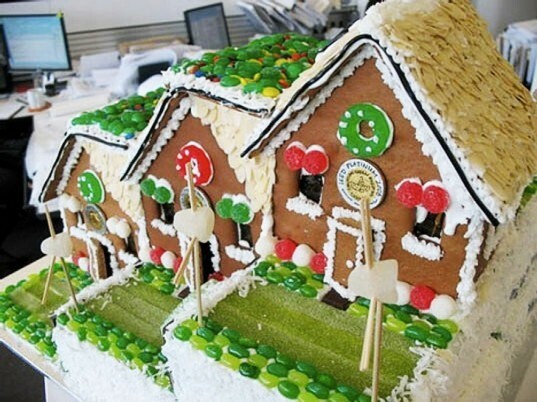 HOK, one of our favorite eco-minded firms, decked the halls of this gingerbread home with so many sustainable systems it even achieved LEED Platinum! Featuring Hershey’s Chocolate solar panels, gumdrop wind turbines and black licorice rainwater collectors, we're pretty sure they've set a precedent with this scrumptious home. SUGAR SHACK Nick Milkovich Architects' Sugar Shack is definitely a stunner that draws upon the style of various modern greats. A simple sugar abode sits atop an inclined site of gingerbread and icing, affording amazing views from within its near transparent and tasty space. Hopefully those surrounding sugar trees will keep things cool inside when the sun shines bright. Nick Milkovich Architects' Sugar Shack is definitely a stunner that draws upon the style of various modern greats. A simple sugar abode sits atop an inclined site of gingerbread and icing, affording amazing views from within its near transparent and tasty space. Hopefully those surrounding sugar trees will keep things cool inside when the sun shines bright.